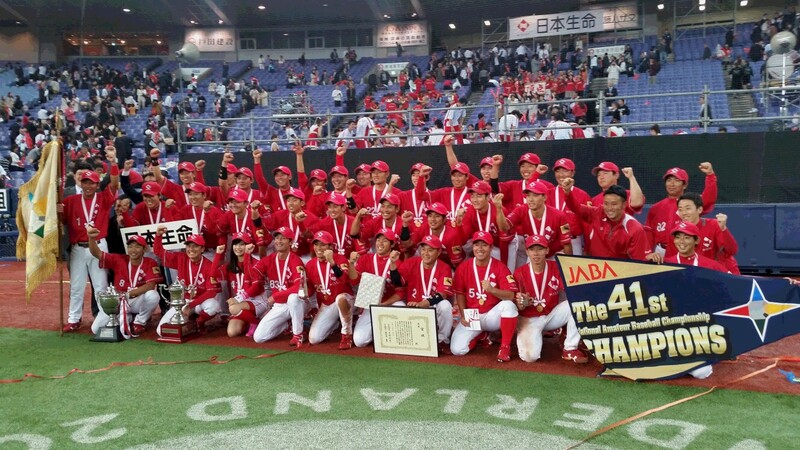 The final game of the 41st　National Championship of Japan Amateur Baseball Association (JABA) co-hosted by The Mainichi and Osaka City, participated by 34 teams at Kyocera Dome Osaka on November 9th 2015 saw winning of Nippon Life Insurance, thanks to the skilled leadership and tactically cleaver players. Manager Sogo’s command of changing of pitchers timely in the final game against Honda lead Nippon Life winning the game in the bottom of the last inning. Overall, 12 games out of total 31 in the tournament for 10 days ended the loser without scoring runs. Total home-runs were 10 only, the lowest since 2002 when wood bat was introduced. Geographically, teams from Kinki area accounted for half of the top 8 and those from Tokai and Kyushu regions did not come up to expectations.